Its not a surprise that the PC version of the new Battlefield 3 game will no doubt be able to handle higher graphics settings to create a more refined image within the game. 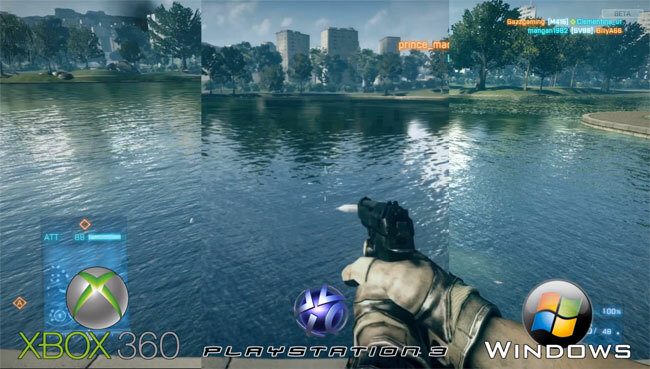 But have you wondered what the game will look like on all three systems, PC, PS3 and Xbox 360 side by side? Well heres your chance to see the results from the Battlefield 3 beta which is currently open to all to play until October 10th. Watch the video after the jump to see the comparison between the different gaming systems. You can also check out Battlefield 3 Beta : Performance Preview And Operation Metro Walkthrough videos on our recent article to see if you need to purchase any hardware upgrades before the game launches on October 25th, 2011 for the PC, PlayStation 3 and Xbox 360.